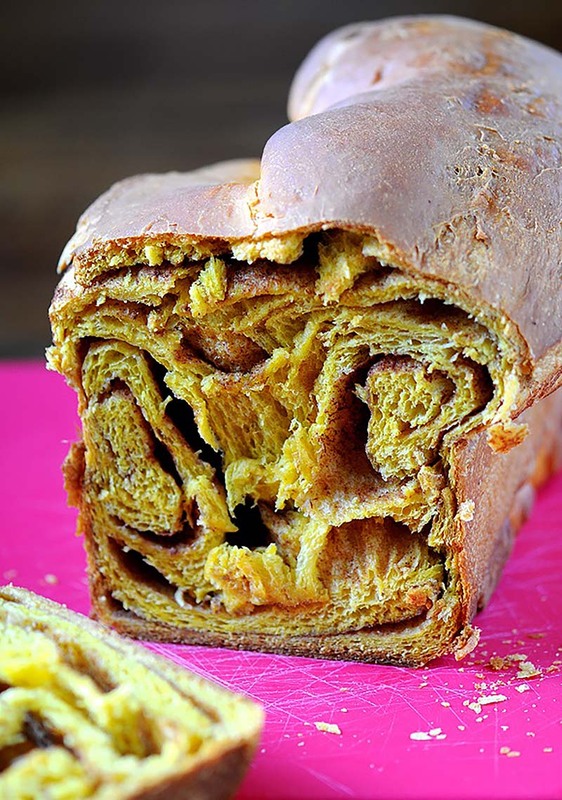 Pumpkin pie spice and cinnamon-sugar swirled in a rich pumpkin brioche bread. Enjoy this Fall-inspired bread with a cup of coffee for breakfast. Combine the milk and yeast in the bowl of a stand mixer fitted with a paddle attachment, whisk until the yeast is dissolved. Let stand for 5 minutes, then stir in the pumpkin puree, sugar, and flour, forming a thick batter. Cover with plastic wrap and let rest in a warm environment until bubbles form, 30-40 minutes. Add the flour and salt to the sponge; mix to combine. Add the eggs. Mix on low speed for 2 minutes, or until the eggs are absorbed. Increase to medium speed and knead the dough for 5 minutes. The dough will begin to slap around. Hold on to the mixer if necessary. On medium-low speed, add the butter, 2 TBSP at a time. Stop the mixer and scrape down the sides of the bowl occasionally. Switch to the dough hook at this point. Knead until the dough is shiny and smooth, about 5 minutes. Scrape out the dough, wash and dry the bowl, and coat it lightly with oil. Place dough in the oiled bowl and turn it so that the top is coated with oil. Cover with plastic film and let rise at room temperature until doubled in volume, about 2 hours. After the dough has doubled in volume, press down to deflate, folding one half into the other. Cover with plastic wrap and refrigerate for at least 4 hours or overnight. This is the second rise. Remove brioche dough from the fridge. Turn the dough out onto a lightly floured surface. Cut dough into two equal halves. Using a rolling pin, roll it into a rectangle as thin as you can get it. Use a pastry brush (or your hands if you like to get messy) to spread 3 TBSP of butter around the rolled out dough, leaving an 1-inch margin at the top edge with no butter. Combine cinnamon sugar and pumpkin pie spice. Sprinkle evenly over the butter, rubbing in with hands to make sure that it sticks. Starting from the long side closest to you, roll up the dough like a jelly-roll. Fold it into thirds and do your best to shape it into a loaf shape. Cover the dough with plastic wrap coated with pan spray, and let rise at room temperature until it has doubled in size and filled the pans completely, 1 ½ to 2 hours. Toward the end of proofing, preheat the oven to 400°F. Adjust the rack to the center of the oven. Bake for 10 minutes. Turn down the oven temperature to 350°F and bake for and additional 30 minutes until it has a golden crust and an internal temperature of 180°F. Remove the brioche from the pans as soon as they come out of the oven and cool on a rack before serving.